I recently started a couple of projects that will involve using shapefiles and I got frustrated real fast. Many tutorials that I found assumed some previous knowledge of either shapefiles or the python libraries used to manipulate them. But what I wanted was a tutorial that helped me to plot a simple shapefile while getting to know what a shapefile actually is! So here’s a SUPER simple example of how to load, inspect and plot a shapefile to make a map of the U.S! There are quite a few Python libraries dealing with shapefiles and it was hard to find the easiest place to start. I found the pyshp Python library the most approachable, so that’s what I use in the following example. There are many ways to visualize shapefiles in a more automated way than I do here, but I think that my approach here gives a clearer picture to a beginner of what a shapefile is and how to use Python with shapefiles. Go get yourself a shapefile! The one I used (which will definitely work with my code below) is the lowest resolution state-level cartographic boundary shapefile from census.gov (link to census.gov, direct link to lowest resolution 20m .zip file). Once you download the .zip file, unpack it and take a look inside. 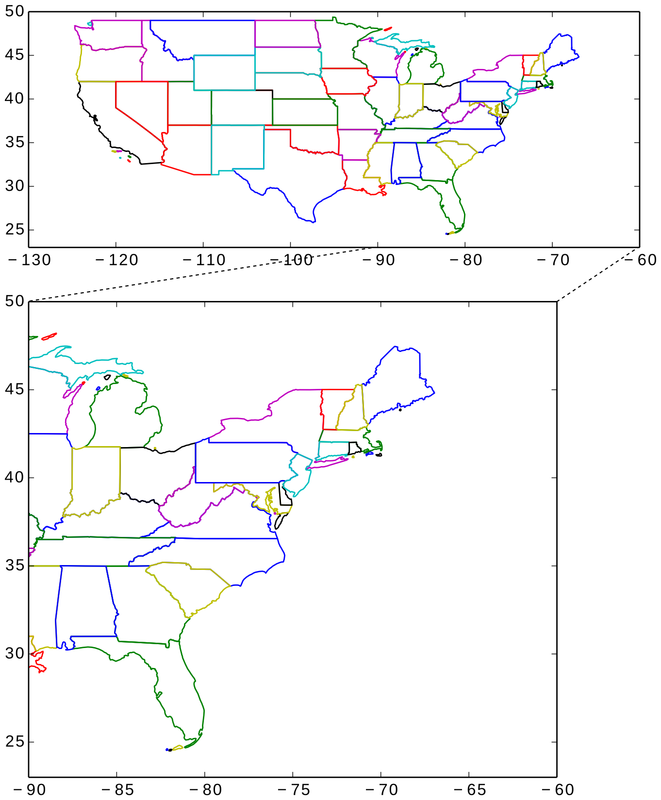 A shapefile is actually a collection of different files, including a .shp file containing information on shape geometry (state boundaries in this case), a .dbf file containing attributes of each shape (like the name of each state) and others (check out the wiki page on shapefiles for a description of the other file extensions). The three plots described below should pop up. For the census.gov state boundary shapefile, this returns 52 for the 50 states, Washington D.C. and Puerto Rico. For each shape (or state), there are a number of attributes defined: bbox, parts, points and shapeType. The pyshp documentation describes each, and I’ll touch on each one in the following (except for shapeType). This returns the state of Oregon! I also used the bbox attribute to set the x limits of the plot. bbox contains four elements that define a bounding box using the lower left lon/lat and upper right lon/lat. Since I’m setting the axes aspect ratio equal here, I only define the x limit. The issue is that in some of the shapes (states), the geometry has multiple closed loops (because of the islands in some states), so simply connecting the lat/lon points creates some weird lines. Now that I feel pretty good about the information contained in a shapefile and how it’s stored, I’ll be moving on to more exciting visualizations. It’s important to note, that there are many Python libraries that can plot shapefiles without manually pulling out the points as I’ve done here. But I feel much better about using those fancier approaches now that I’ve gone through this exercise. Also, in this post I’ve only touched on the geometry information in a shapefile. But it’s really the records included in the .dbf files that will make this an interesting visualization. The records contain measurements, observations or descriptions for each shape and that information can be used to color or fill each shape to create visualizations like this one (not my work). In my previous post, I outlined how I took the NYC yellow cab trip record data and made some pretty maps of Manhattan. Given how many variables are tracked, there are many possible avenues of further exploration. It turns out that the average speed of taxis holds some interesting trends and in this post I’ll describe some of these trends (code available at my GitHub page). I also calculated the median speed (solid curve) and the first/third quartiles (dashed curve) at each time of day. As expected, rush hour is evident in the rapid drop in speed from 6-10. I didn’t expect such a large peak in the early hours (around 5) and I also found it interesting that after the work day, speeds only gradually increase back to the maximum. These distributions are highly skewed, to varying degrees. The 5-6 time range (blue curve) sees a much wider distribution of speeds compared to the work day (9-18, green curve) and evening (20-24, red curve). Because of the skewness, I used the median rather than the mean in the 2-D histogram plot. Similarly, the standard deviation is not a good representation for skewed data, and so I plotted the first and third quartiles (the dashed lines in the 2-D plot). The difference between the 1st and 3rd quartile (the interquartile range, or midspread), is a good measure of how the distribution of average cab speeds changes (plotted above, right, if the data were normally distributed, this plot would just be a plot of the standard deviation). Not only are taxis going faster on average around 5-6 am, but there’s a much wider variation in taxi speeds. Traffic speeds during the work day are much more uniform. Generally, the average speed decreases with increased number of cabs (increases with decreased cab count), but the changes are by no means linear. It’s easiest to read this plot by picking a starting time: let’s start at 6am, up at the top. At 6am, the average speed with about 1000 hired cabs on the road is about 23 mph. From 6am to 9am, the number of cabs increases, causing traffic to slow to about 12 mph. From 9am to 7pm, things get complicated (see the zoomed inset below), with the number of cabs and average speed bouncing around through the workday until 7pm, when the cab count drops and average speed rises in response. Eventually, the loop closes on itself, forming a sort of representative daily traffic cycle for Manhattan. When I first looked at this, it immediately reminded me of hysteresis loops from all my thermodynamics classes. 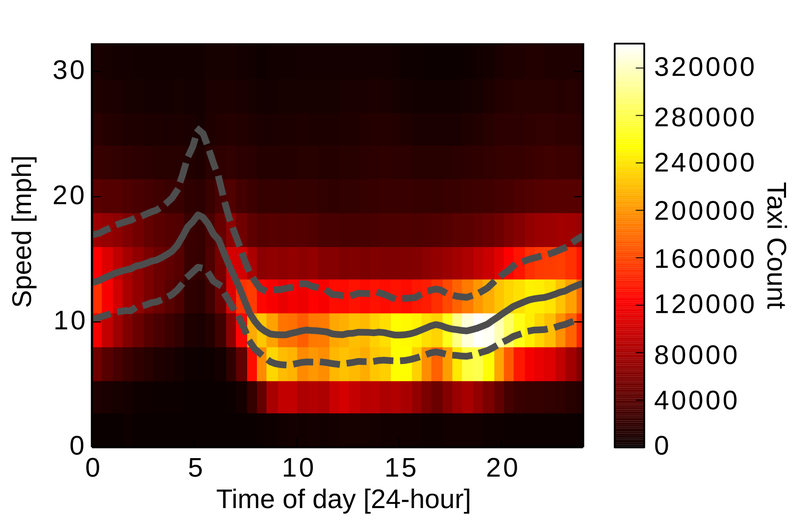 And so I started googling “Traffic Hysteresis” and it turns out there’s a whole field of study devoted to understanding hysteresis loops in traffic patterns in order to better design systems of roadways that can accommodate fluctuations in traffic volume (e.g., Zhang 1999, Geroliminis and Sun 2011, Saberi and Mahmassani 2012 ). One of important differences between those studies and the brief exploration I’ve done here is that the above studies have counts of total traffic. The calculations here only consider the taxis floating in the larger stream of traffic. While these taxi tracers are still a good measure of average flow of traffic, the number of hired cabs at a given time is only a proxy for total traffic. A lot of the complicated behavior during the workday (9am-7pm) likely arises from changes in traffic volume not accounted for like delivery trucks, commuters or buses. So in some ways it’s remarkable that I got a hysteresis loop at all! I described most of the methodology for reading and manipulating the NYC yellow cab data in my previous post. The two main additions to the code are a new class in taxi_plotmod.py (binned_variable) and an algorithm for finding the number of hired taxis (find_N_unique_vs_t of taxi_plotmod.py). The binned_variable class returns a number of useful values including median, first quartile, third quartile and binned values. 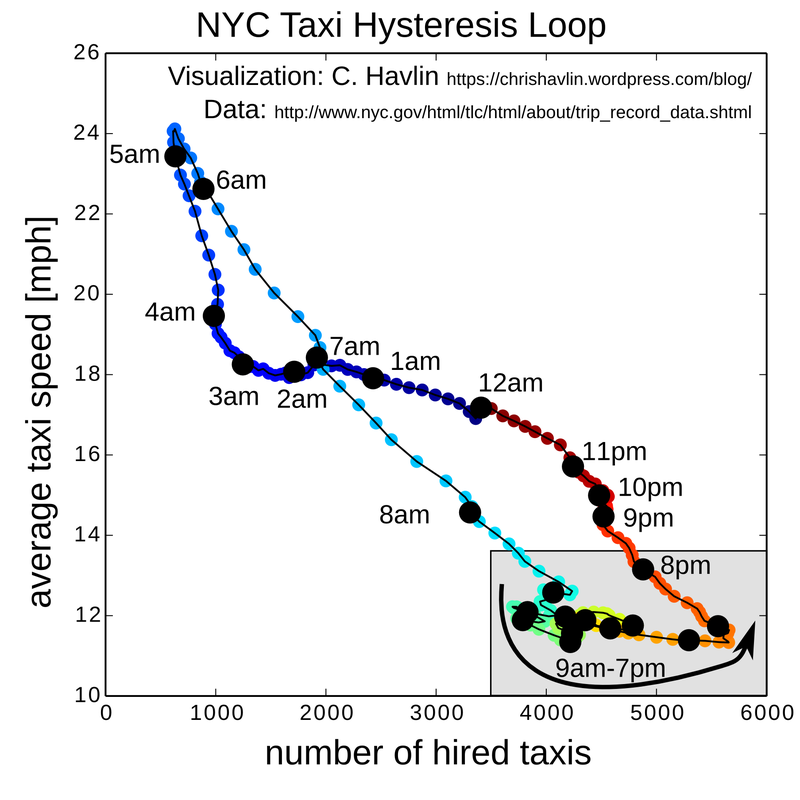 The method find_N_unique_vs_t loops over a given time range and counts the number of taxis that are hired during that time. The where command finds all the indeces with values less than the median at a given time of day, so var2bin[np.where(var2bin<self.med[i_bin])] selects all values that are less than the median (self.med[i_bin]) from which a new median is calculated. Stay tuned for either more taxi analysis or some fun with shapefiles! The city of New York has been recording and releasing trip data for every single taxi ride in the city since 2009 (TLC Trip Data, NYC) and these publicly available datasets are treasure trove of information. Every single time a NYC taxi picks up a passenger, 19 different pieces of information are recorded, including gps coordinates of pickup and dropoff, total fare and distance traveled. Think about how many cabs you see while walking the streets of New York and then imagine how many times in a day just one of those cabs picks up a passenger… yeah, that’s a lot of data. A single data file from TLC Trip Data, NYC contains data for one month between 2009-2016 and weighs in at a MASSIVE 2 GB. There have already been plenty of cool visualizations and analyses of this data set, Todd W. Schneider processed the ENTIRE data set from 2009-2015, amounting to over a billion taxi trips (link) and found lots of interesting trends. His comparison of yellow and green taxis to Uber rides in individual boroughs (link) is particularly interesting. Chris Wong created a visualization that follows a randomly selected cab through a day of driving (link) and Juan Francisco mapped over 10,000 cabs in a 24 hour period to create a mesmerizing video (link). Both used the start and end points from the TLC Trip data and created a best guess route via the Google Maps API. It’s pretty fun to watch the taxis jump around the city, especially if you happen to have just read Rawi Hage’s novel Carnival, in which the main character, a cab driver, describes one type of cabbie as “the flies”, opportunistic wanderers floating the streets waiting for passengers and getting stuck in their own web of routine. In my own exploration of the data, I’ve been following two main threads. The first, which I’ll describe today, is map-making using gps coordinates of the taxis. 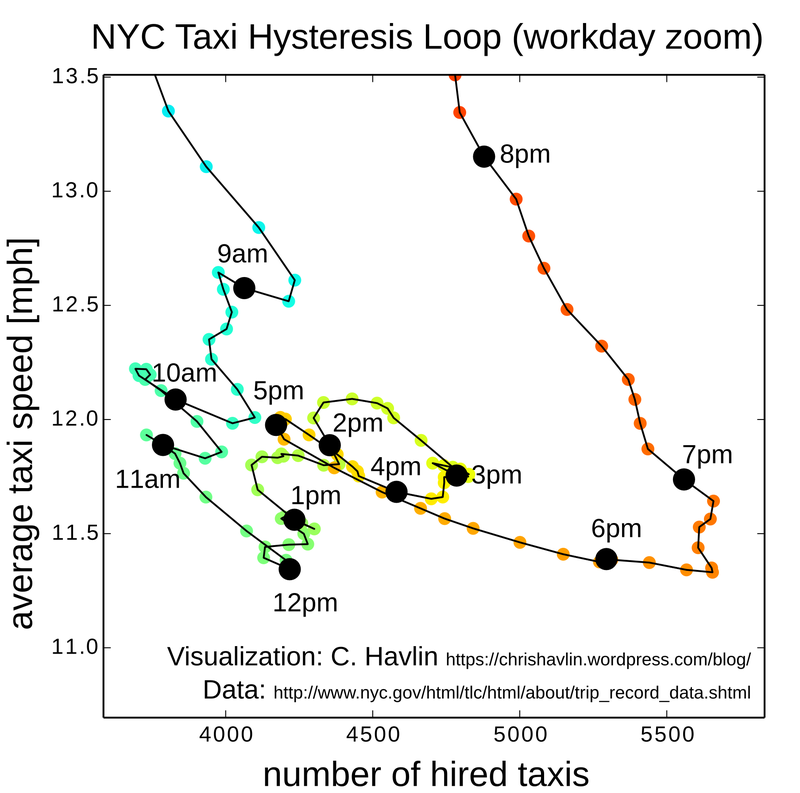 The second, which I’ll leave to a future post, involves a more statistical analysis of the data focused on understanding average taxi speed. I’ll start by describing the final product, then dig into the details of my coding approach (python source code is available on my github page here). Taxi Maps (the final products)! This map was made by creating a rectangular grid spanning New York City and counting how many pickups occurred within each grid bin (more details on this below) within three months. The color scale is the base-10 log of the number of pickups in each bin (yellow/white are a lot of pickups, red are a lower number and black are no pickups). The horizontal direction (longitudinal) is divided into 600 bins, while the vertical (latitudinal) is divided into 800 bins, a grid fine enough to resolve individual streets. The level of detail visible in this map is impressive. My eye was initially drawn to the odd half-circle patterns in the East Village, which it turns out is Stuyvesant Village. It’s also odd that the bridges to Brooklyn and Queens show up at all. I’m pretty sure it’s impossible for cabs to pick up anyone on one of these bridges. Perhaps the presence of the bridges arises from uncertainty in the GPS coordinates or cabbies starting their trip meter after getting on the bridge? Hard to say. But it’s kinda neat! The other very clear observation is the drop in cab pickups in Manhattan around the north end of Central Park. The NYC Taxi and Limo Commission observed this same feature and calculated that 95% of pickups in Manhattan occurred south of this boundary, which led to the creation of the green Boro taxis in order to provide more equitable access to taxis (more info here and here). The map is fairly uniform in color, except for around Wall Street and the southern tip of Manhattan, where the more yellow coloration shows a generally higher trip distance. It’s hard to pick off numbers from the color scale, so I took the map and created a modified zonal average; at each latitude, I averaged across the longitudinal grid points, only using grid points with non-zero values, and then plotted the result (above, right). The line plot shows pretty clearly that cabs picking up passengers around Wall Street tend to go about 2 miles farther than trips originating anywhere else. Why is this? Hard to say without a lot more analysis, but 4 to 4.5 miles happens to be about the distance up to Penn Station or Grand Central Station, so I suspect commuters who don’t mind spending extra money to avoid the subway on their way to the train. The TLC yellow cab data dictionary, describes what each entry is, but the ones I find most interesting are: pickup time (entry 2), dropoff time (entry 3), passenger count (entry 4), trip distance (entry 5), pickup and drop off longitude and latitude coordinates (entries 5, 6, 9 and 10, respectively), total fare (entry 12) and tip (entry 15). So in most basic terms, all I’ve done is read each line of the file, pull out the entry of interest along with its gps coordinates and then find a way to plot that aggregated data. The source code (available here) is divided into two python modules: taxi_main.py and taxi_plotmod.py. The first deals with reading in the raw .csv files while the second contains routines for processing and plotting that data. The source includes several a README and several scripts that show examples of using modules, so I won’t go into that here. Rather, I’ll describe my general approach along with several problems I ran into (and their solutions). Reading in a single csv data file is relatively straightforward. The standard open command (open(filename, ‘r’)) allows you to read in one line at a time. The functions of interest are in taxi_main.py: read_taxi_file loops over all of the csv files in a specified directory and for each file calls read_all_variables. I did add some fancy indexing in the form of a list of strings that identify which of the 19 variables you want to save (see the Vars_To_Import variable) so that you don’t have to import all the data. Check out the main function in taxi_main.py to see an example of using the commands to read in files. Each data point has a latitude, longitude and associated measurement (the color of the dots in the case of the conceptual image above) and the data points are spatially scattered according to their coordinates. To make a gridded data product, I first specified a latitude/longitude grid (dashed lines, left). I then find which points lie within each bin, aggregate the measurements within a bin and then store that new single value in the bin. In this conceptual case, I’ve averaged the color of the data points to define the new gridded data product. 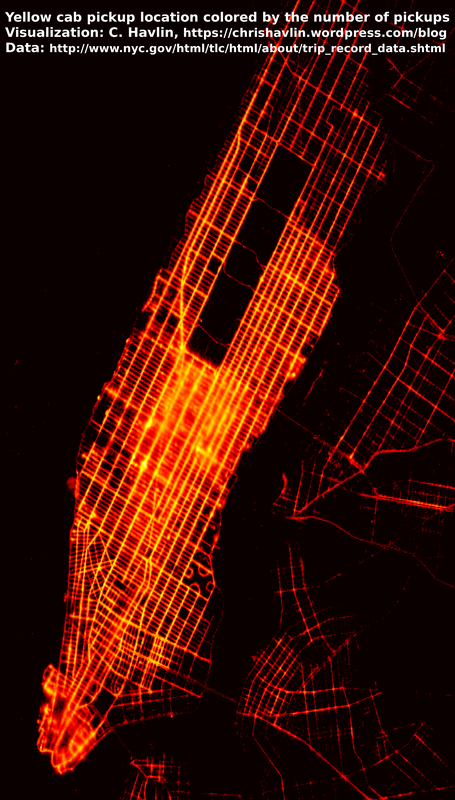 In the NYC taxi maps shown above, the color is first determined by simply the total number of measurements within a bin and then the average of all the trip distance measurements within a bin. Since the reading of the raw data file and subsequent spatial binning can take a few minutes, the code can write out the gridded data products (see the main function in taxi_main.py). These files are only a few MB in size, depending on the resolution of the grid, so it’s much easier to repeatedly load the gridded data products rather than re-processing the dataset when fine tuning the plotting. pyTip: where. One of the useful python tricks I learned in this is the numpy routine where that identifies the indeces of an array that meet a specified criteria. Say you have a giant array X with values between 0 and 100. If you want to find the mean of X, but only using values less than 50, you could use np.mean(X[np.where(X<50)]). Why is this approach so bad? Well, it involves searching through the entire data set of N values each time through the loop. N is huge (the smallest cases I ran have N > 50,000, for the maps above, N>1000000), so for a fine grid like in the maps above (where Nx = 600, Ny=800), this is incredibly slow. A simple switch, but it scales to large values of N, Nx and Ny much better. The above maps took only a few minutes to process using the second (good) approach, while when I initially tried using the first (stupid) approach, the code was still running when I killed it after 30 minutes. 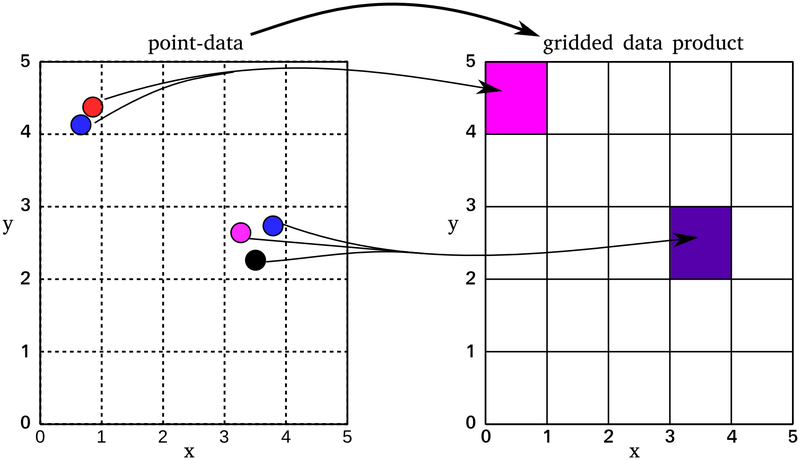 Plotting the spatially binned data: The plotting makes use of the matplotlib module, specifically the pcolormesh function. I went through a lot of color maps and ended up settling on ‘hot.’ Gives the maps an almost electric feel. Not much else to say about the plotting, pretty standard stuff. Check out plt_map within taxi_plotmod.py if you want the detail. 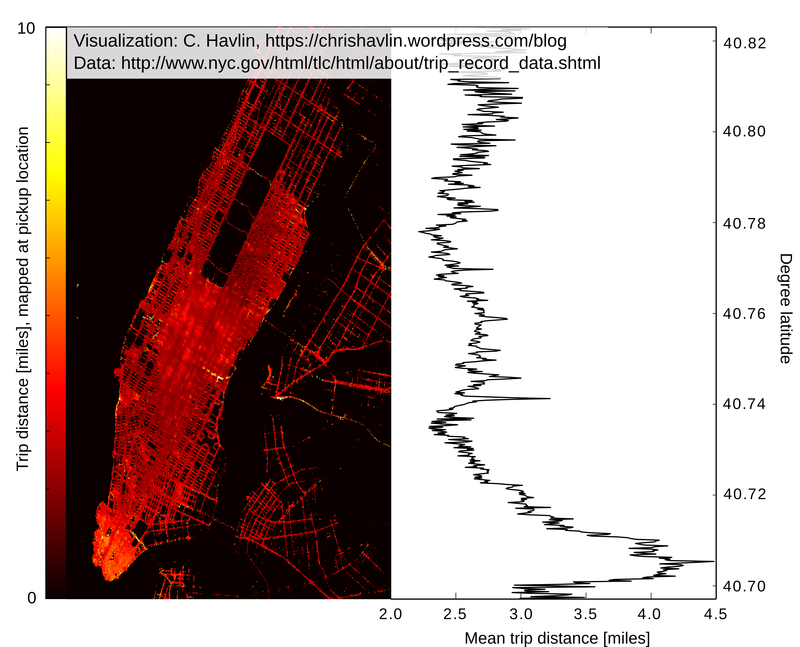 Stay tuned for more exploration of the NYC taxi data! In their recent article, “Spatializing 6 ,000 years of global urbanization from 3700 BC to AD 2000”, Reba et al. describe efforts to create a digital, geocoded dataset tracking the distribution of urban locations since 3700 BC. The digital database provides a record of human movement over the geologically recent past and is useful for understanding the forces that drive human societies towards urbanization. The database seemed like a fun test of my fledgling python skills and in the post here, I’ll describe a visualization of Reba et al.’s database. Reba et al. released their data here. My python source is available vi GitHub here. As this is my first actual post on the blog here, let me remind you that I’m something of a python noob. So if you actually check out the full source code, I expect you’ll find lots of mistakes and perhaps some poor choices. You’re welcome to let me know of all the ways I could improve the code in the comments section below. Before jumping into what I actually did, a bit more on the dataset. Reba et al. (2016) created their new digital database from two earlier compilations, Chandler (1984) and Modelski (2000,2003). The authors of those previous studies meticulously scoured archaelogical and historical records in search of locations of urban centers. Reba et al. took those datasets and created a .csv file listing each city’s name, latitude, longitude, population estimate and a time corresponding to the population estimate, a process that involved transcribing the original databases manually (ouch!! none of the available automated print-to-digital methods worked) and geocoding each entry to obtain a latitude and longitude. In the end, Reba et al. ended up with three digital .csv datasets: Chandler’s database for urban centers from 2250 BC to 1975 AD, Modelski’s ancient city database covering 3700 BC to 1000 AD and Modelski’s modern 2000 AD database. All told, there are just over 2000 unique cities recorded between the three databases, many of which have multiple population estimates through time. I was pretty impressed by Reba et al.’s work and decided their dataset would provide an interesting context to improve my python. So I set out to write some python code capable of importing the database and making some pretty plots (source code here). Note that I do not distribute Reba et al.’s database with my source, you’ll have to download that separately from their site here. See the README file in the source code for a list of other dependencies required to run the code, which was only tested with python 2.7. Before digging too deeply into the code, let’s just start with the end product. Here’s an animation of Chandler’s data set from 2250 BC to present day. Each circle is an urban center and the color of circles changes from blue to red as the time approaches present day. Pretty neat! We can see clustering and expansion of early urban centers around Mesopotamia, then seemingly separate loci of urban development popping up in East Asia and Central America. Along South America, it’s interesting how urban centers trace out the coastline. And as the animation approaches present day, the number of urban centers explodes (from 1960 to 2014, the percentage of the world’s population living in urban settings increased from 34% to 54%). The three main steps to producing the above animation were (1) import the data, (2) subsample the data and (3) plot the data. The module urbanmap.py includes all functions needed to reproduce the above figures. And the scripts ex_animate.py and ex_single_frame.py are examples that call the appropriate functions to create the above animation and single frame plot. In the following, I’ll walk through the different steps and their related functions in urbanmap.py. Again, full source code is here. The function works with any of the three original plain text, comma separated valued (CSV) files from Reba et al. : chandlerV2.csv, modelskiAncientV2.csv and modelskiModernV2.csv. Some of the Alternate City Names have commas within quotes, which causes those entries to split. Adding the second argument (skipinitialspace=True) to csv.reader prevents those commas within quotes from being read as a new comma-separated value. The remainder of the function reformats the data into arrays that I find more flexible to work with. First, I generate an array called Time, which contains every time for which a population record exists. In the original .csv files, the header line of each Population column gives the time at which the population estimate corresponds to. The header values are strings, such as BC_1400, BC_1390,…,AD_100,AD_110,AD_1000… So the first thing I do is convert these header strings to a 1D numpy array where each element of the array is the time in years before present (ybp). Why go through all this trouble? Well, let’s say I want all cities with a recorded population for the time range 1400 BC to 50 AD. If I knew the header values exactly, I could find the indeces in Time_string corresponding to BC_1400 and AD_50. But the headers aren’t uniform within a single .csv file or across .csv files. The way I’ve constructed the Time array, however, allows for straightforward conditional indexing. The usefulness becomes more apparent after reading in the remaining data and I describe it in section 2 below. The next lines (lines 74-101 of urbanmap.py) are pretty straightforward. Each row of the database is read in and distributed to one of three arrays: PopuL, city_lat and city_lon. The latter two contain the latitude and longitude of every city. PopuL is a 2D matrix with a row for each city and a column for each population record (i.e., PopuL.shape() returns n_city by n_Times). So at the end of all this, I select the lons and lats that are not equal to 999 and those are the longitudes of the cities with a nonzero population within the specified time range. Neat-o! I can now return these lon/lat values and make some plots! Now that we’ve got a function to subsample the data, we can plot that data in a number of ways. The simplest place to start is to put all the lat/lon of cities with a nonzero population record for a specified time range on a map. This is what the __main__ function of urbanmap.py and the script ex_single_frame.py accomplish. In both, I sequentially call load_cities and get_lon_lat_at_t functions then plotting the resulting lat/lon values using the basemap toolkit (mpl_toolkits). The plotting is accomplished in two functions: urbanmap.base_plot() and urbanmap.city_plots(). The first creates a basemap object with the background image of the globe while the second actually puts the current lat/lon values onto that background image. base_plot() follows this example pretty closely. The following, from ex_single_frame.py, shows the full sequence to plot cities within a current time span. 39        # be BC, BCE, AD or CE. Now that we have functions to pick out cities within a time range and then plot those points, creating an animation is conceptually straightforward. I just needed to repeatedly call get_lon_lat_at_t and city_plot, varying the time range each call. However in practice, sorting through the animation routines in the python animation package was the trickiest part of this whole exercise. I quickly gave up on using the animation routines, and simply looped over a time range, subsampling and plotting at each increment, saving the figure at each step along the way. I was then left with a bunch of image files (the frames of the animation), which I then concatenated into an animation using a bash script and ImageStack. In the end, I managed to figure out the python animation routines, and that’s I included in the source code. PyTip: shifting the basemap. I used two functions to rotate the center longitude of the map: mpl_toolkits.basemap.Basemap() and mpl_toolkits.basemap.shiftgrid(). The Basemap function creates the longitude/latitude projection while shiftgrid rotates the topography data to align with the Basemap. 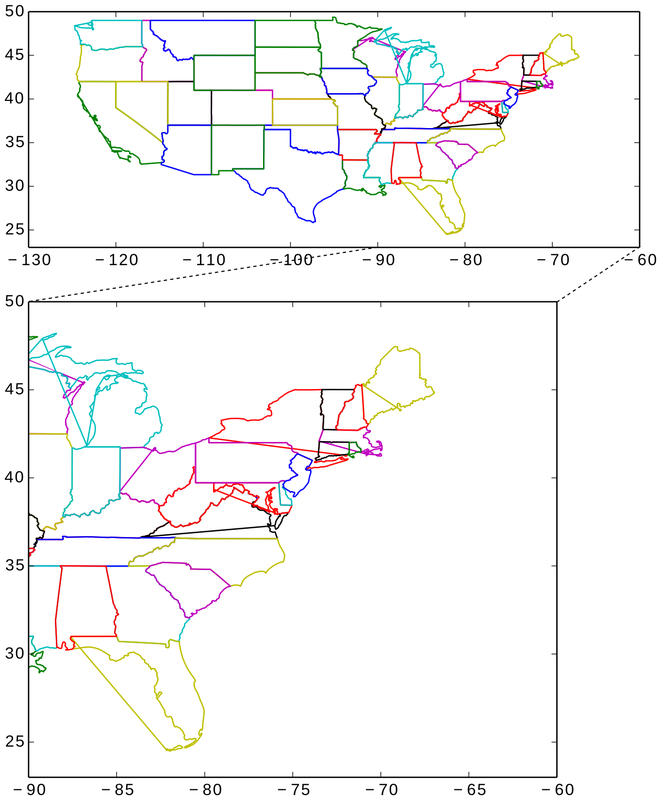 BOTH functions take an argument lon0, but in Basemap, lon0 is defined as the center longitude of the projection while in shiftgrid lon0 is the westernmost longitude. I was tripped up by this for a while because I assumed lon0 had the same meaning in each… whoops. PyTip: accessing the data for animation. Most of the tutorials for the animation function (matplotlib.animation.FuncAnimation) are relatively simple and are set up to re-calculate the data to plot at each frame. The issue I ran into was that FuncAnimation animates a specified function by sequentially feeding it a frame index. I couldn’t figure out how to pass additional arguments (the full dataset) and importing the data set at each frame would be way too slow. I had an existing dataset that I wanted to read in only once at the start of the program. I first got around this by declaring the database variables (PopuL, city_lats, city_lons,…) as global variables so that they’d be accessible within the FuncAnimation call. This was pretty easy but I’m always a little uncomfortable using global variables. My approach in the end relied on simply better understanding how python handles variables. By nesting all of the animation functions under one top level function, any variables set in that top level function are available at the lower levels (in a sense, they’re locally global?). I found this post useful. Reba, Meredith, Femke Reitsma, and Karen C. Seto. “Spatializing 6,000 years of global urbanization from 3700 BC to AD 2000.” Scientific data 3:160034 doi: 10.1038/sdata.2016.34 (2016). Chandler, Tertius. “Four thousand years of urban growth: an historical census.” The Edwin Mellen Press (1987). Modelski G. World Cities: -3000 to 2000 (FAROS 2000, 2003). Some occasional visualization and statistical analysis of open data sets using python. Code is released via github (https://github.com/chrishavlin) in case you want to dig into it. Enjoy!